In many inter forest migration projects, the mailbox migration to the new Exchange Organization into the new forest is performed first and the user migration is performed in a separate step at a later time. After the mailbox migration and before migrating the user objects, you have a classic Resource Forest scenario. 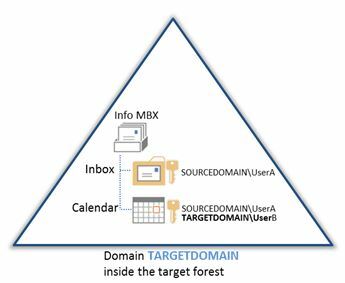 Users are created as disabled user accounts in the target forest, receiving a linked mailbox, connected to the source Active Directory user. Important AD attribute in this scenario is msExchMasterAccountSID. This attribute of the disabled target user object holds the objectSID of the source user account. This allows to connect to the own mailbox and shared mailbox resources (Delegate permissions etc.) with the active source user object. Did you ever thought about mailbox folder permissions in this scenario? In Active Directory Migration projects, it is best practice to migrate the SIDHistory to the target user account. In this case, the objectSID of the source user is copied to the attribute SIDHistory of the target account. 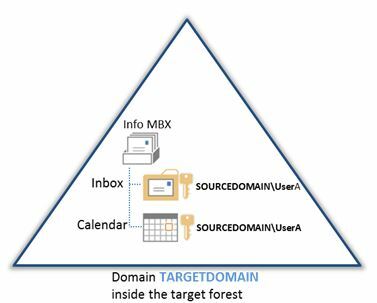 For our example, it means that UserA will not lose access to the Info MBX because his Access Token contains the Source SID which has permissions on the Inbox and Calendar folder in the Info MBX. SIDHistory CleanUp & mailbox folder permissions? Clearing SIDHistory is part of most of the migration projects. Before clearing the SIDHistory attribute of the target accounts, it is required to replace the source SIDs with the corresponding target SIDs inside the mailbox folder permissions. This process is called ReACLn. Without this action, many users will lose access to shared mailbox resources when the SIDHistory attribute is cleared. Dell migration Manager for Active Directory contains the Exchange Processing Wizard. 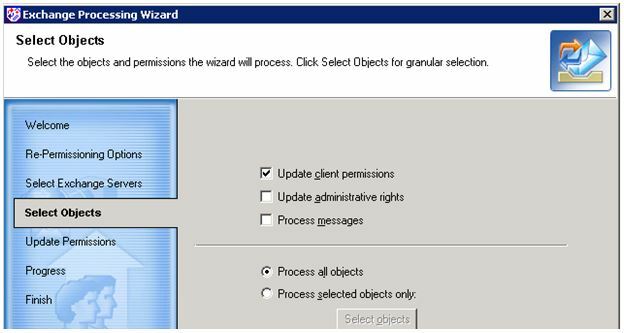 This wizard is able to replace existing source SIDs with the matching target SIDs for permissions inside the exchange environment. The wizard is using the matching information in the QMM AD LDS database, created during the directory synchronization. The wizard provides the possibility to only process one server or process multiple servers in parallel. Get-MailboxfolderPermission: Unfortunately, as long as the SIDHistory is set for a user, Exchange will always resolve the permissions to the target account. So Exchange will always show the TARGETDOMAIN\User although in fact the source SID has permissions on the mailbox folder. You will also see the same result if you query folder permissions via EWS (e.g. with EWSEditor). To check which SID is really behind the permission, you can use MFCMAPI to access the mailbox. Create a new profile for mailbox and disable Exchange Cached Mode. Click Session->Logon and choose the profile you’ve created in step 1. Double Click the Mailbox entry and now navigate to the folder for which you want to display the permissions. In the Smart View, you can see which SID is really behind the Access Control Entry.